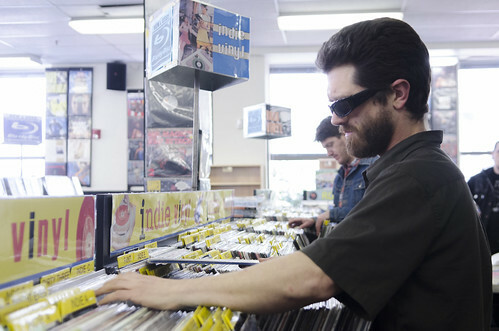 Jesse McCaffrey, 35, sifts through the records at Rasputin in Downtown San Francisco the afternoon of April 15, 2012. "I started off with a few hundred vinyls," McCaffrey said. "Now I have more than 7,000. I used to drop $300 a month on records." Photo by Gil Riego Jr.
With a renewed appreciation for tangible tunes, music fans are dusting off their old turntables and boomboxes for another spin. It can be hard to believe that vinyl records and cassette tapes are surviving in the age of digital music when even CDs have begun to lose their luster. But significant rises in sales and interest in these “old” forms of music are disproving the digital dominance of today’s music industry. “In the past three years, vinyl sales have gone up 20 percent each year,” said Tony Green, manager of Amoeba Music on Haight Street. Green currently has his hands full preparing for Record Store Day April 21, the annual celebration of record stores worldwide. Stores like Amoeba and Rasputin Music will feature special events and deals on records pressed specifically for the commemoration’s fifth year. “I can attest to a visual growth in our vinyl section. A lot of indie bands are pressing more vinyl,” said Muzae Sesay, who works at Rasputin Music on Powell Street. Vinyl records are pricier, both to press and purchase, but the drag-and-drop of MP3s isn’t cutting it for a lot of music lovers. The physicality of a record is very much a part of the musical experience, and people are willing to pay the price. Businesses like Record Pressing, located on Haight Street, offer a variety of visual options for musicians looking to press vinyl albums. Color and picture discs allow bands to get creative in ways they couldn’t with CDs or digital downloads. For musicians low on funds, cassettes may be the creative way to go. While vinyl records are high quality but costly, cassettes are low quality but cheap. If an artist is willing to sacrifice sound quality, they can record several copies of an album independently and at a low price. Cassettes haven’t seen huge sales increases like vinyl records have, but there are a few labels like Sanity Muffin and Beach House that are devoted to releasing music on tapes. Where critics see “hipness,” musicians like Carlos Salas of the San Francisco punk band Wild Moth see a way to regain the creativity lost in the rise of downloadable music. Salas believes that vinyl records and tapes are neither dead nor vintage. “With the fall of the music industry, smaller, independent labels have taken control, and most of these labels are based off artist integrity, and a vinyl record is way more of a piece of art than a CD made out of petroleum,” he said. With about a dozen San Francisco shops participating, Record Store Day provides an opportunity for music lovers to celebrate the spirit of vinyl while also supporting independent record stores. It may be convenient to shop for MP3s online, but many people will never turn entirely to the web for their tunes.